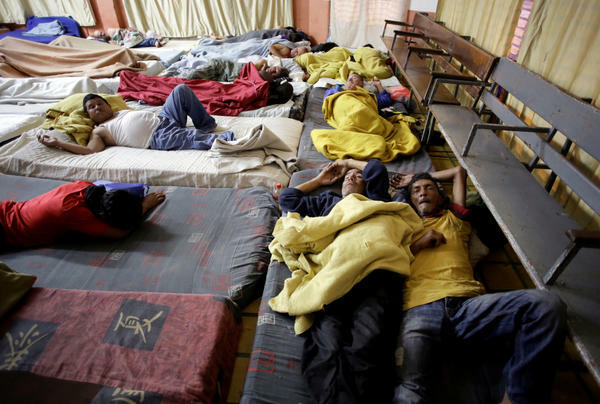 Nicaraguan refugees fleeing their country due to unrest sleep in a Christian church in San José, Costa Rica, on July 28. 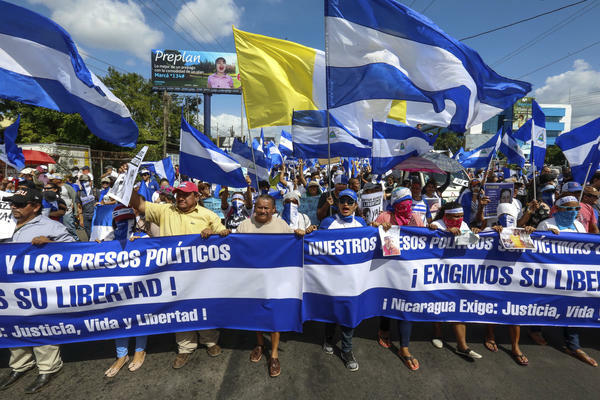 Demonstrators march to demand freedom for political prisoners in Managua on Aug. 11. The ongoing unrest in Nicaragua began in April, when President Daniel Ortega announced cuts to the social security system and small protests by senior citizens were violently broken up. One of two camps the Costa Rican government has set up for Nicaraguan (and other refugees) increasingly coming to the country. This one in La Cruz, Costa Rica, about 10 miles from the Nicaraguan border, has 60 tents and can shelter up to 2,000 refugees. According to U.N. officials, 200 Nicaraguans are applying for asylum in Costa Rica daily. Nicaraguan refugees fleeing their country due to unrest take part in a demonstration to thank the people of Costa Rica for their support in San José, Costa Rica, on Wednesday. 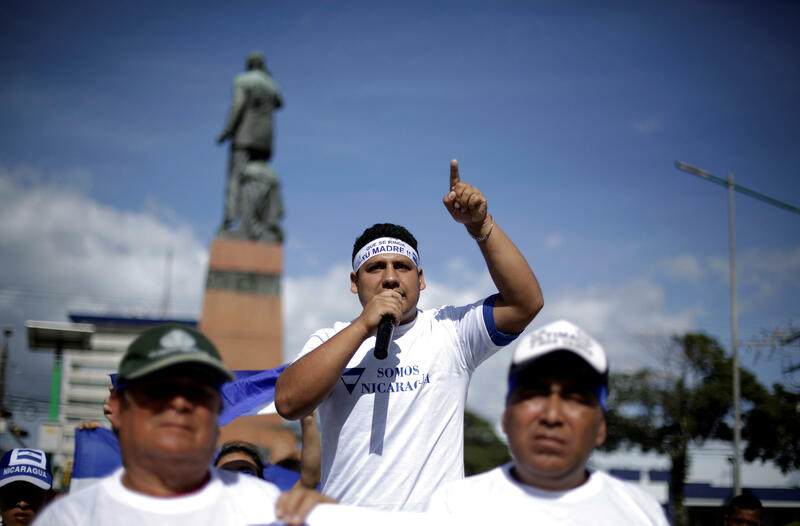 For more than four months, Nicaraguan President Daniel Ortega has responded forcefully to nationwide protests, which initially began in opposition to a hike in social security taxes and quickly erupted into a call for his resignation. More than 300 people have been killed, hundreds more disappeared and thousands have fled the country, according to the Nicaraguan Center for Human Rights, a nongovernmental organization in Managua. The Organization of American States has condemned what it calls "serious human rights violations" perpetrated by Ortega's government and allied "parapolice forces" against protesters. Last month, police and armed militias stormed into a small central Nicaraguan town where José Murillo and his friend Freddy Mondragón guarded a blockade, a round-the-clock protest against President Ortega. Outmanned and out-armed, Murillo says their simple brick barricade quickly fell. "The government had us already on their list, a long list of all those in town who supported the anti-government protests," says 54-year-old Murillo. He says a fellow protester from their town was arrested and told relatives to warn the others about the list. "That's when the persecution began," adds Mondragón, who is 43. Both men, who worked in farming and construction, say they heard that masked men came looking for them at their homes. "We fled into the mountains," he says. "We survived up there for 15 days. It was harsh, very harsh, so we decided we had to keep moving and we came here," says Murillo. A week ago, along with five others from their town, the group walked for three days, crossed a river by boat, sneaked into Costa Rica and arrived in the small northern town of La Cruz. They aren't alone. As many as 23,000 Nicaraguans have come seeking asylum in Costa Rica since anti-Ortega protests erupted across their country in mid-April, according to the United Nations refugee agency. The pace of refugees fleeing picked up greatly after Ortega launched a repressive crackdown on protesters in mid-July, killing hundreds and jailing thousands. The U.N. refugee agency said, as of July 31, an average of 200 Nicaraguans are applying for asylum every day in Costa Rica and called on international support to aid the refugees. 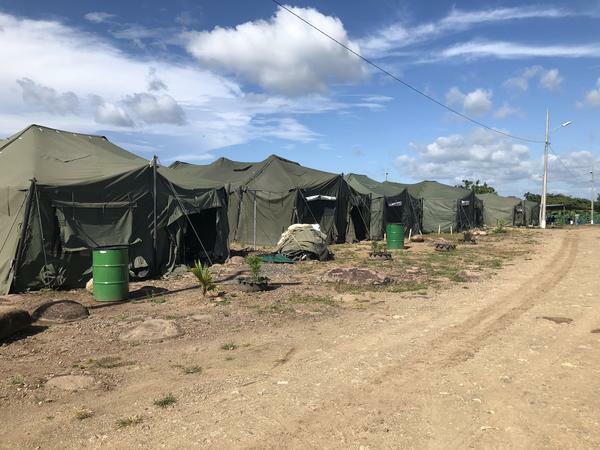 Murillo and Mondragón are staying in a tent shelter set up by migration authorities a mile and a half outside La Cruz. They want to claim asylum, but that requires getting to the capital San José, about 170 miles away by bus. The fare will cost about $10 each, which neither of them have. Relatives back in Nicaragua have wired some money, but at La Cruz's Western Union office, the cashier tells Murillo through a glass window that he can't give it to them. Murillo and Mondragón fled without a passport and neither have a Costa Rica-issued ID. Many Nicaraguans coming across the border have a family member already in Costa Rica, which has a history of taking in migrants. The International Organization for Migration estimates as many as half a million Nicaraguans live here. For those without a relative to stay with, the camp, able to shelter up to 2,000 people, is a lifeline. Inside the expansive camp, set up in an empty lot, a group of Nicaraguans play dominoes on a picnic table placed in an outdoor kitchen. Across the dirt field are a dozen portable shower stalls, port-a-potties and a large stone basin to hand wash clothes. Uriel Cruz is sitting out the domino game. He's trying to get a fire started in one of the wood-burning stoves to make some coffee. A skinny pipe is helping him fan the flames with some direct air. Cruz, who is 46 and married with two sons, says he worked in his northern Nicaraguan town as a legal adviser to the mayor. After the protests began, he says, the city started taking half his paycheck to fund pro-government protests and pay the paramilitary fighters. After he complained to his employers, he was summoned to late-night meetings at city hall with unidentified armed men. The last time they called him in, he says, he didn't go. "They were probably going to kill me or throw me in jail for being a terrorist," he says. Thousands have been jailed in recent weeks since President Ortega enacted a sweeping new law that critics charge criminalizes all types of protest. Punishment is up to 30 years in jail. For now, some residents of La Cruz say they are happy to help out the refugees. Leonor Perea owns a seafood restaurant down the street from the refugee tent camp. Her specialty is a large bowl of fish soup. "We should help them, they are our neighbors," says Perea, who's owned the restaurant for 42 years. But she says she hopes the authorities are properly vetting them to weed out any bad elements. But some Costa Ricans' patience may be waning. Last weekend, protests broke out in a downtown San José park where many Nicaraguans congregate. A crowd holding Costa Rican flags and shouting "Nicaraguans go home!" clashed with residents supportive of the immigrants and refugees. Authorities arrested 44 people and seized machetes, knives, Molotov cocktails and a baseball bat, San José police told local media. Costa Rican President Carlos Alvarado responded to the violent outburst in the capital urging the country to avoid falling into "provocations or hatred." "Today we are receiving people in our country, some are wounded or at risk, others are persecuted. Due to their vulnerable situation they seek refuge or a peaceful place in our country," he said in a televised message. But he also promised his government will screen the newcomers and deport any who threaten national security or break the law. Back at the tent shelter, Uriel Cruz says he hopes talks will resume between President Ortega and a coalition of civic and church leaders seeking a peaceful solution to the crisis and early elections for next year. But he's not optimistic. Neither are others in the camp. Some say they are willing to take up arms in order to return — a troubling sentiment given Nicaragua's history of bloodshed during the 1979 revolution and subsequent U.S.-backed Contra war that lasted more than a decade. "We need international help to come in and remove Ortega," says Cruz. "All we want is to go back home."